On Friday night, March 28, 2008, my good friend Judy Gula opened her new shop, Artistic Artifacts Annex. 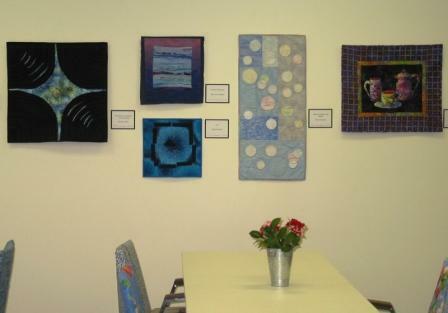 On the same night, the Annex hosted a show of art quilts by a collection of Northern Virginia Artists. 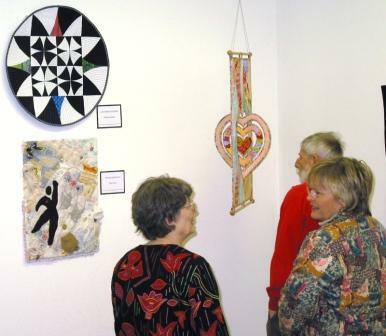 This shot shows the entrance, which includes quilts by Priscilla Stultz (left), Elly Dyson (center), and Jean Schachner (right). The quilt on the far right is by the owner, Judy Gula. 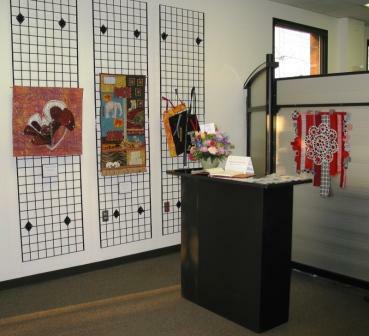 The Annex offers an important option for Northern Virginia fiber artists: workshop space. It’s a place where artists can gather, see new things, discuss art, and rent table space to work alongside established artists. There are new products and a lot of samples and explanations for how to use them. There’s even a place for folks to relax until the shoppers are finished! On opening night, this nook featured a busy backgammon board. This shot shows part of the back wall of the classroom and a few more quilts! From the left, these quilts belong to Marsha White, Mary Ann Shepard (top), Kathy Edwards (bottom), Dotty Eisenhour, and Cathering Armstong. The classroom can accommodate 15-20 students depending on the class activities, and it makes a great meeting place for small groups. In this corner, you can see a few more pieces from the exhibit. The work is by Kathy Edwards (top left), Mary Kerr (bottom left), and Linda Cooper. In my next entry, I’ll show you the rest of the exhibit and tell you more about the new shop. Stay tuned! I’m not sure who you are, but thank you. One of my students nominated me for Professional Quilter Magazine’s 2008 Teacher of the Year. There were 18 nominees this year and I am honored to be on that list. Whoever you are, mystery nominator, I thank you. For the record, this year’s honors go to Susan Shie. From everything I hear, Susan is a wonderful, caring, talented teacher and is very deserving of this honor. I love her work and I hope to meet her someday. I wholeheartedly congratulate her. I believe we grow up thinking in terms of winning and losing, as though these are mutually exclusive concepts. I don’t think they are. I didn’t “win” the award, but I didn’t “lose” either. Somewhere out there is a student who valued her class experiences enough to take the time to research the nominating process and complete the steps. Winning the award would be great, but winning the approval of my students is better. In this case, it really is an honor to be nominated. For more information about Susan Shie, the nominees, and Professional Quilter Magazine, visit http://www.professionalquilter.com. Look for the issue containing 2008 Teacher of the Year information in April.